One of the hardest decisions you can make as a homeowner is when to go ahead with a full roof replacement. Sometimes, the capricious Colorado weather can make that decision easier. In the event of irrecoverable hail damage, there’s no choice but to replace your roof. In other cases, though, it can be a matter of weighing costs and sifting through insurance policies. When you’ve committed to full roof replacement, you also have another decision to make: what type of material to use. 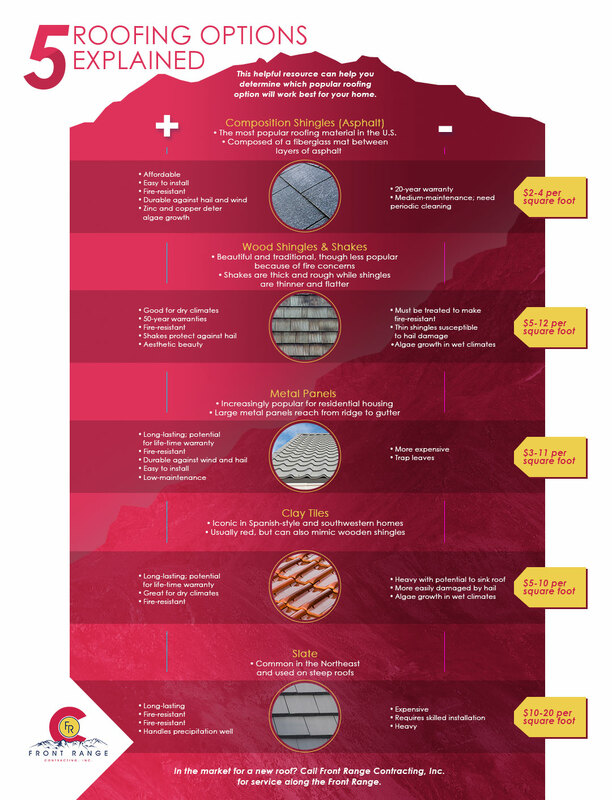 Because this decision should not be taken lightly, we’ve compiled a useful resource that delineates the advantages and disadvantages of common roofing materials. Browse this resource to get a sense of the best roof material for you, and feel free to contact our roofing contractors to ask any questions. Composite shingles are the most popular roofing material in the U.S., and for good reason. A fiberglass mat lays between two layers of asphalt, adding unprecedented durability to this option. Affordability — asphalt shingles run between $2 and $4 per square foot, making them considerably less expensive than other roofing materials on the market. Ease of installation — thanks to their popularity and structure, asphalt shingles are much easier to install. This means less of a chance of faulty installation and a quicker turnaround time in general. Fire-resistance — asphalt shingles have some of the best fire safety ratings, especially compared to wood shingles. Durability — depending on the durability you select, you can have asphalt shingles specifically built to withstand harsh Colorado hail and wind. Cleanliness — the zinc and copper present in composition shingles deter mold and algae growth. Customization — if you want it, composite shingles can offer it. You can completely customize the look of your roof based on color, texture, size, etc. 20-year warranty — no matter how well you maintain your roof, you should expect to replace composite shingles within 20 years. Periodic cleaning — we refer to composite shingles as “medium-maintenance.” While they are inherently clean thanks to the zinc and copper, they still need periodic cleaning and inspection. Because there are so many different options available when it comes to composite shingles, we recommend speaking with your roofing contractor directly. They can walk through warranties and make recommendations based on your specific location. For instance, the quality of composite shingles varies greatly. Think of them like a car engine: you can get excellent quality or you can opt for the more economic option. If you live in a hail-prone area like Denver and the Front Range, consider installing composite shingles with a ULL 2218 Class 4 rating at least. Wooden shingles are exactly what they sound like. They are more traditional aesthetically than composite shingles, and they generally are thicker and rougher in appearance. Durability — most wood shingles (or cedar shakes) come with a whopping 50-year warranty. This means that, with good maintenance and installation, these roofs should last for a half-century. Traditional beauty — asphalt shingles are becoming more sophisticated, but there’s nothing quite like the classic beauty of wood shingles. Resistance to storms — if you live in a hail- and wind-ridden area, wood shingles are sometimes your best defense. They typically weather storms better than their counterparts. Energy efficiency — because wood shingles are more hefty than asphalt ones, they’re proven to provide natural insulation that is two times better than that of asphalt shingles. Cost — wooden shingles cost far more right off the gate compared to other roofing types. Because the material is more intricate to install, it often requires more labor from your roofing contractor. Additionally, the material itself is more expensive than asphalt or metal. Maintenance required — to keep wooden shingles healthy for 50 years, you must consistently maintain them, clean them, and have them inspected for water damage. Metal roofs have become increasingly trendier in the last decade, and they offer a host of benefits if you’re willing to go this less traditional route. Durability — like wooden shingles, metal roofs are celebrated for their durability. In fact, a metal roof can last a lifetime because you don’t need to worry about water damage and wear-and-tear as much. Fire-resistance — metal won’t catch on fire, so it’s a great option if you live in a fire-prone area of Colorado. Resilience — hail and wind are often no match for a strong metal roof. While hail can damage anything in its path, metal roofs still tend to fare better. Easy installation — metal doesn’t require the same intricate shingle-by-shingle installation of traditional roofs. Cost — because metal roofs should last a lifetime, they’re more expensive off the bat. Debris removal — metal roofs tend to trap debris more than shingled roofs do. As such, you need to keep regular roof and gutter cleaning on your schedule. If you’re in the market for a new roof in Denver, Colorado Springs, Boulder, or along the I-25 corridor, look no further than our roofing contractor. Contact us today to schedule your roof inspection or replacement.